A few years ago I got it in my head that I should buy a professional camera– a Canon Mark II. I deliberated for about a year before taking the plunge– or rather, watching my bank account take the plunge. It was the most expensive purchase I had made (after my home)– and once I owned the camera– I was scared to touch it. My careless hands and my lack of experience surely prove I am too dangerous to handle such an expensive piece of equipment. The camera sat unused for several months… maybe even a year. Eventually and with some prodding from a professional photographer friend, I got the courage to use the camera…. I discovered it’s one of the best investments I’ve made and I have no regrets.. except that I waited so long to use it. I took the camera on her first trip to Europe a few years ago. Hauling the camera around my neck with the heavy telephoto lens inspired me to name the camera, “Big Bertha.” Big Bertha and I get a lot of stares and curious looks, which I must admit I enjoy. Since that first trip, Big Bertha and I have been on various adventures– local and abroad. She has brought me much joy and I’ve enjoyed using the camera to bring happiness to others. 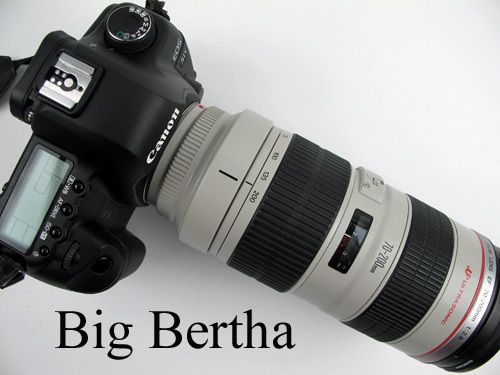 My friends even refer to the camera as Big Bertha and invite her to photography adventures. 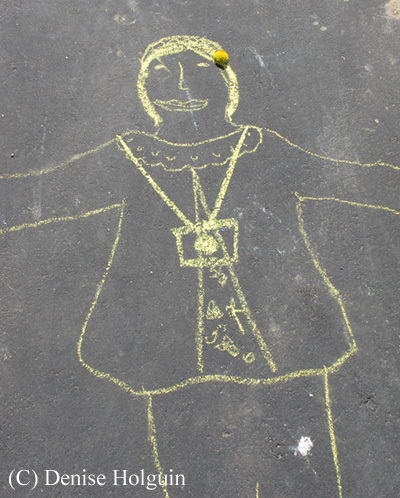 Earlier this year my friend Karina Ramirez suggested I start a blog for Big Bertha. I tucked the idea away in my mind until the right time… which is now! This blog will focus on photography– and while it was inspired by Big Bertha, I’ll also show other photos using my Canon G11– which is my ‘everyday’ camera, as well as a couple other models of point and shoot cameras I’ve had over the years. For your reference, I’ll indicate the camera used for each photo posted on the blog. I hope you enjoy this blog. It is my goal that this blog inspires you to try something new, to invest in something you love, to see things from a different point of view and to not be afraid to try. Barring disaster, this will be a daily blog. In the event I am not connected to the Internet I’ll put the content together anyway and will post upon return to civilization.